The INTA Annual Meeting, held each May, is the largest and most prestigious meeting of the international trademark community, with more than 7,000 participants from more than 130 countries taking advantage of five days of educational programs, committee meetings, exhibits, social events and networking opportunities. Last year, in Seattle, we met a great group of bloggers, including Jeremy Phillips, the host of this week's Blawg Review #261. This year, in Boston, many of these same bloggers and more will be getting together at Lucky's Lounge on Monday, May 24th, from 8pm until whenever. Everyone's welcome, so even if you can't make INTA but are in Beantown, please join us. INTA’s Annual Meeting is the trademark community’s premier event for networking, continuing legal education, and committee and client meetings. Valuable skill-building workshops, industry breakouts, interactive table topics, and trademark law sessions focused on international and U.S. topics, are packed into three days of education, while numerous other events present the ideal opportunity to expand your reach and meet with colleagues. 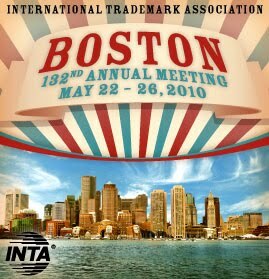 This year, the 132nd annual meeting of INTA from May 22-26, 2010, presents a great opportunity for Boston blawgers to come out and meet many law bloggers who are in town for this major conference. These guys and girls know how to party! MEET THE BLOGGERS VI is hosted by Pam Chestek, Marty Schwimmer, Ron Coleman, and John Welch, who made the announcement here. Like everyone else invited, I'm just happy to have this chance to meet the bloggers at INTA's Annual Meeting again this year. Wouldn't miss it for the world. If you're planning to meetup with us at Lucky's Lounge, on Monday, May 24th, please send me an email or DM on Twitter @blawgreview and we'll make note of it here. We expect a lot more, for sure, so if you're coming please confirm so we can let everyone know. It's gonna be huge this year.